Drove from New York. Trip also included the Everglades, the Florida Keys, and Titusville with a nighttime shuttle launch - stayed off site. 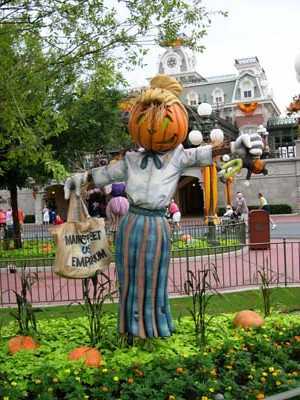 Magic Kingdom, Epcot, not sure about MGM. Drive down was fun. Coming back was a drag. Too old now to try this again, My back would hate me! 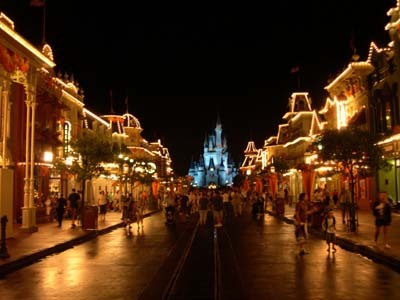 Magic Kingdom, Animal Kingdom, Epcot, Islands of Adventure and Universal Studios. All Star Movies Resort – Mighty Ducks building. Solo trip before starting new job at Benjamin Moore – Epcot, Islands of Adventure (rode the Fire and Ice roller coasters 7 times in a row till I was wobbly). 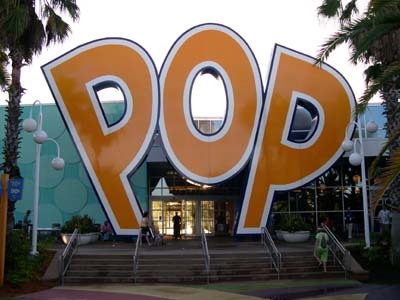 Stayed at Pop Century, 50’s Building. Solo trips can be awesome! 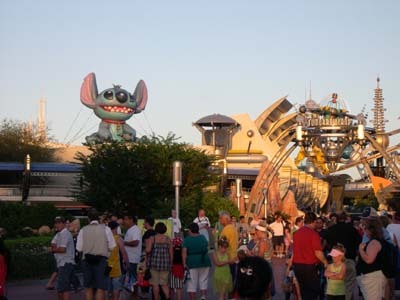 Family trip with group of 22 – Pop Century 50’s Building, including Magic Kingdom, Animal Kingdom, Epcot, MGM Studios, SeaWorld, Islands of Adventure, Typhoon Lagoon, Pleasure Island. Best to do one thing in the mourning together - then break up into smaller groups! We woke up at 3:45 AM! Ah, vacation – a time to rest, relax and catch up on sleep. Oops, no, this is a Disney vacation! We had a 6 AM flight thanks to AirTrans rescheduling our flights 3 times. 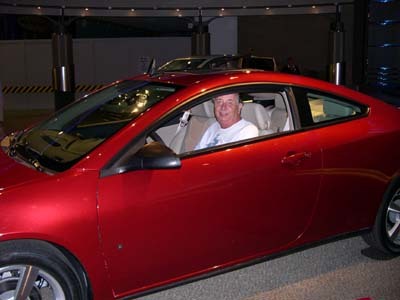 The Limo, with Bill, picked us up at 4:30 and twenty minutes later we were at Westchester County (White Plains) Airport. The first leg to Atlanta was uneventful and we grabbed a Burger King breakfast during our one hour lay over. Boarding the connecting flight to Orlando was delayed a bit as the plane was late, and then we were furthered delayed by a 35 minute wait taxiing to take off. We landed 30 minutes late. There was almost no wait to check in and we stopped at the food court for a quick bite. Kelli and I split a double cheese burger and Bill had a pizza. We drove over to the 90’s building and just as I parked a few rain drops fell. It was getting very dark and we just made it to the building when the skies opened up. A band from Hurricane Ike reached all the way over to give the area a good soak. We were in room 8230. It was adequate as usual but when I turned on the TV, there was no Stacey. I was used to our past stays in when you turn on the TV it would always turn on the Disney channel with Stacey and her top ten must sees at WDW and usually at a high volume! This time it always turned on to video 1 instead of a channel. This was a benefit since you can turn down the volume of the TV before changing it to a channel and not wake up everyone in your wing. Stacey fans – not to worry – we found her on channel 18 or 19. By the time we settled in the room the weather had lessened to a light shower and we headed for the buses. The shortest distance between the 90’s Building and the Food Court/Bus stops was through the parking lot! We slipped through parked cars all trip long. We just missed a Magic Kingdom bus and waited about 15 minutes for the next one. 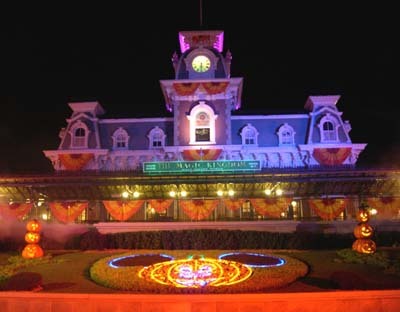 It was great to see the Kingdom with its Halloween decorations. 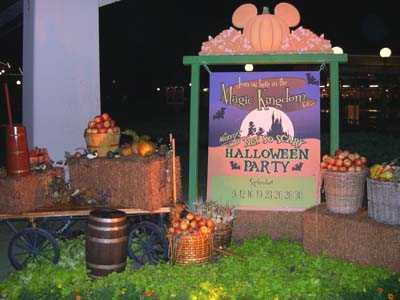 We had tickets for Friday’s “Mickey’s Not So Scary Halloween Party.” Crowds were very low. No real wait for anything. 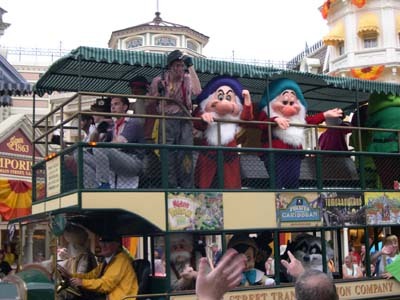 We saw the Main Street Trolley Parade as soon as we entered. 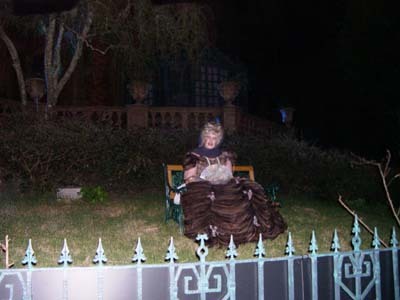 Then headed for the Haunted Mansion and enjoyed the refurbishments. The ghost bride and the floating head were great. 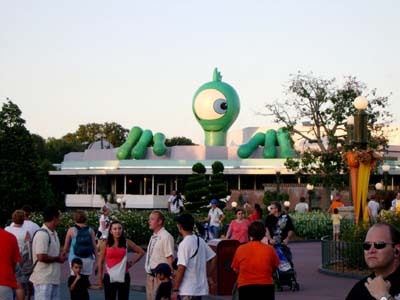 Bill had yet to see the Monster’s Incorporated Laugh Floor so we headed over for that. It was a great show. They did more audience interaction then we remember from our Disneymoon a year ago and it helped. Next was Buzz Light-year. 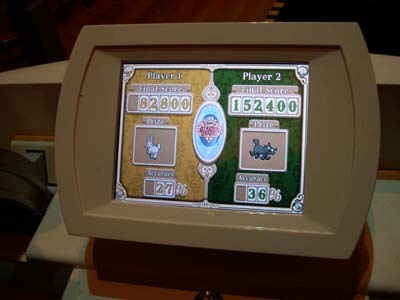 I had top score with 255,200, with Bill 127,400 and Kelli with 35,700. 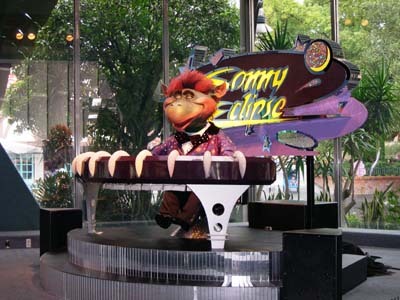 We relaxed with a ride on the TTA and stopped into an empty Starlight Café to see Sonny Eclipse do a few songs. We headed out and caught the last half of the flag retreat. I was surprised on how this affected me. 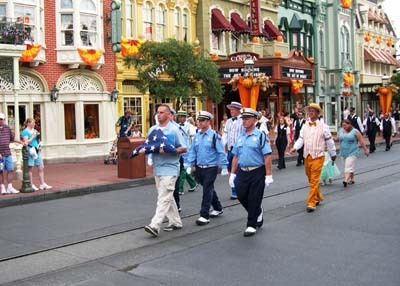 It was very moving the way they treated the flag with so much respect, parading it down the first part of Main Street preceded by the marching band. 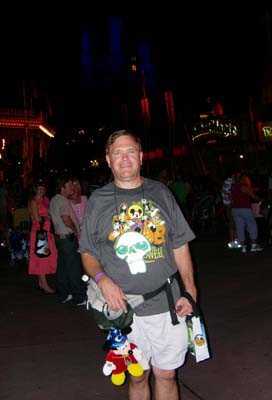 Bill headed back to Pop Century while we caught a boat over to the Wilderness Lodge for our 6:05 ADR at Artist Point. After rubbing Humphrey’s nose for good luck (the bear at the bottom of the totem poll outside the gift shop) we headed to the restaurant. We had a fantastic dinner. For appetizers Kelli had the Mixed Greens Salad with Strawberry Dressing, Black Diamond Cheddar, Candied Pecans, and Cocoa Nib Gremolata, while I ordered the Braised Penn Cove Mussels with Fennel and Grilled Sourdough Toast. These were the best prepared mussels I ever had. After devouring all the perfectly cooked mussels I soaked up every last bit of the juices with bread. Kelli’s salad was fantastic and had such a great mix of flavors and textures. Our main dishes were Grilled Buffalo Sirloin Steak - with Sweet Potato-Hazelnut Gratin and Sweet Onion Jam and the Cedar Plank Roasted Wild King Salmon with Pear and Smoked Pork Belly Hash. For those who never tried buffalo- try it. You’d never know it was buffalo – it was just a superb tasting steak. Artist Point is known for their cedar plank roasted salmon and now I know why, perfectly cooked and wonderful. For desserts I ordered the Hazelnut Chocolate Torte with Blood Orange sauce, and Honey Lavender Ice Cream. Kelli tried the Peach Upside-down cake with warm peach compote, Almond Florentine Tuile, and Peach-amaretto Ice Cream. The torte was a deep dark chocolate that I knew Kelli would enjoy. She loves dark chocolate. So after I gave her a bite we switched desserts but I kept the lavender ice cream and Kelli kept her peach ice cream. Both were great and I already knew we wouldn’t be able to top this dinner with the ones coming up in the next few days. We shopped the gift shop in the Wilderness Lodge and I decided to buy a Pal Mickey – and electronic interactive plush toy. After turning him on we returned to the Magic Kingdom by boat to catch the 9 PM Wishes. 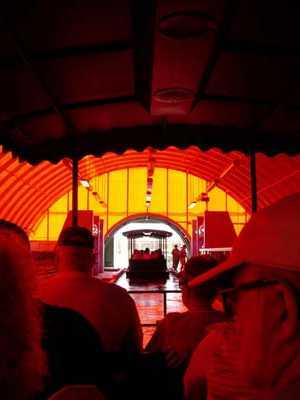 I asked the captain how deep is the water on the water bridge that goes over the road the buses use to get to the Magic Kingdom and connects Seven Seas Lagoon with Bay Lake. 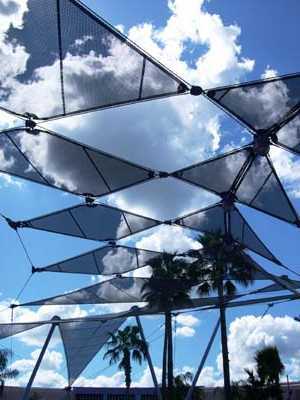 He said it depends on the rains and added that there are only seven water bridges in the world and three are at Walt Disney World. The other two are near Epcot. 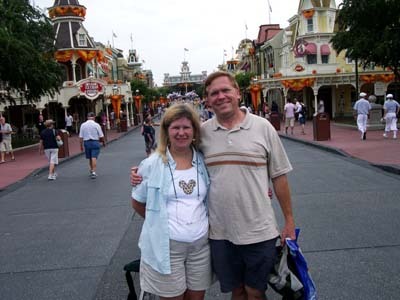 We re-entered the magic kingdom and Pal Mickey shook a couple of times, greeted us to the Magic Kingdom, gave us some jokes and info on the Magic Kingdom, little did we know that would be the last time he ever did anything on his own. 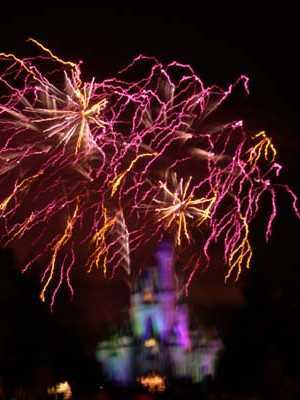 The light crowd made it possible to see the fireworks from the center of Main Street without any long stake out time. This was the first time for both of us to see Wishes from Main Street and they were great as usual. We had only a little wait for the bus back and went straight to the room for some much needed sleep. We woke early, ate at the food court and drove over to Disney’s Hollywood Studios for rope drop. We were the 4th car there. We had to wait at the turnstiles first then at the rope where the Streetmosphere Characters put on a play about filming a scene and the crowd were extras. Good entertainment. The rope dropped and people hurried to Toy Story Mania. CM’s blocked the short cut through the stairs. We only had about 60 people in front of us but stopped for Fast Passes then onto the ride. It was still a short wait and we got to enjoy the oversized games and Mr. 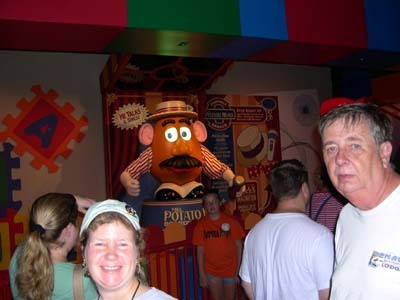 Potato Head in the queue. The ride was fun, exhilarating and tiring on the wrists. We did well in that we didn’t know what to expect since this was the first time on the ride. Kelli scored 64,900 and Bill just beat her with about 75,000. Both had bunnies as the prize. I had 117,400 and the prize was a beaver. When we exited the standby line said 20 minutes but I think it was shorter than that. We tried for the Studio Backlot Tour but it was closed due to technical difficulties. We watched Muppet Vision 3-D and searched the gift shop for another magnetic Beaker that we got last year and anything to do with Dr Bunsen Honeydew but found nothing. These are my two favorite characters since I’m a scientist as well. We headed back to Toy Story and used our fast passes. The Stand-by line wasn’t long at all. It stopped about a row back from Mr. Potato Head, but the passes still saved us an extra 5 minutes. Kelli did much better with 82,800, our friend Bill said he was just over 65,000 and I had 152,400. This time my prize was a cat. I finally noticed that our Pal Mickey was silent and still while we were there. I figured maybe he’d work at Epcot later on. We headed out of the Studios and saw the very end of the High School Musical show. We then drove to the Disney store called the Character Outlet in the Premium Outlet Mall for discounted souvenir shopping. Since we married in 2007 and Disneymooned here, we grabbed anything that had 2007 on it, including 2007 Christmas Ornaments. We also stopped at Goodings Supermarket at the Crossroads near Downtown Disney to buy snacks, bottled water and soda to use for our stay. Bill went for the liquor. Lunch was at the Pop Century Food court and we took some left over bread and pretzels over to the bridge over the large pond and fed the turtles. 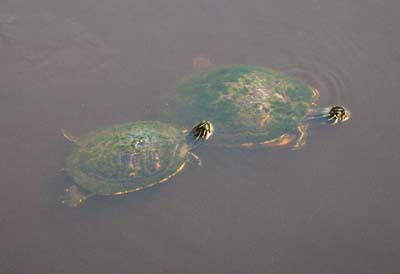 Both Red-eared Sliders and Florida Softshell Turtles were there. The softshell turtles have this weird long neck with a pointy head and two small eyes that pop out of the water like a frog. The turtles and fish weren’t too fond of the pretzels but they loved pizza crust. Kelli rested back at our room while Bill and I cooled and relaxed in the computer shaped pool till they blew the whistle due to “electrical activity” nearby. 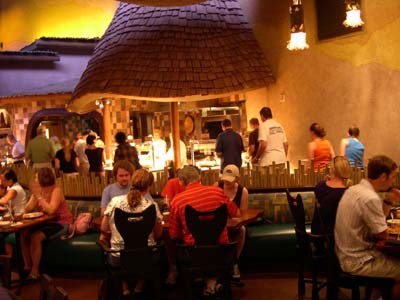 Dinner was at the Animal Kingdom Lodge. We were joined by Bill on our dinner at Bomas. We were really looking forward to our meal. We drove over and checked the savannah in front of the lobby and saw a giraffe along with other animals. We arrived at our ADR 15 minutes early and I barely got the buzzer light from the hostess when it went off. I was a little nervous about Bill, he’s not the type to like anything new or different but I figured he’d be at least happy with the prime rib that they have at this buffet. I was looking forward to trying the Zebra Domes I’ve heard so much about. We all tried a little bit of everything. The prime rib was the best we’ve enjoyed in a long time; lean, but moist and flavorful. The most surprising find was watermelon rind salad. Both Kelli and I loved it. It reminded me of gari (pickled ginger, the stuff they serve with sushi). I noticed that many of the dishes that did have an African flare were slightly sweet. Everything was good; I didn’t find anything I didn’t like. The zebra domes lived up to the hype – they’re GOOD! Kelli thought that they were just OK.
We drove over to the Boardwalk resort and parked. 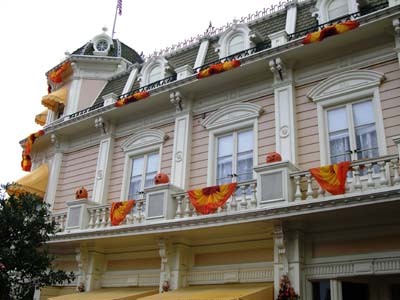 I was thinking about staying here in a future visit due to its location near Epcot and the Studios. 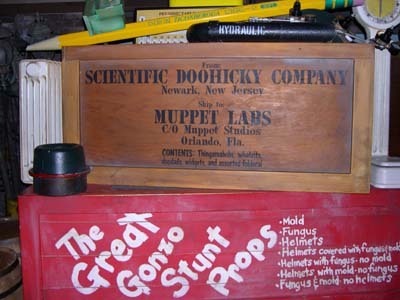 I also wanted to see some of the activities on the boardwalk itself. The walk from the parking lot to the hotel, then through the hotel, down a flight of stairs and out wasn’t short. Unfortunately there was a light rain so the boardwalk was quiet. So we decided to head for Epcot for Illuminations. That walk isn’t short either. After entering through the international gate and seeing how empty it was, we decided to try Soarin’. Kelli and Bill were beat from this further walk but there was no line for Soarin’ and we walk right on. We were in the center section of seats, second row (right exactly in the middle). Our flight was great, better then I remembered. We had two guys next to us, definitely into rap in their late teens or early twenties. They looked out of place in Disney but it was great to hear their reactions to riding Soarin’ for the first time. They gasped at the beginning then were in awe. We took Bill on the The Seas with Nemo & Friends Ride then onto Spaceship Earth. We all loved the video with our faces about our future at the end. We sent an e-mail postcard by computer using a scene from that video in the interactive area - Siemens’ "Project Tomorrow: Inventing the World of Tomorrow. Kelli and I stopped at another really cool kiosk called Body Builder. You put on 3-D glasses and control a mechanical arm to grab body parts to put this skeleton and its organs together. You have 4 minutes to complete the task. While you’re doing this, the unfinished body talks to you, cracks some jokes and tells you about each body part that you’re holding. We finished with about a minute left. After that we headed back to the World Showcase and saw Illuminations (without the globe) in front of Canada. To be honest - I really like it without the globe. You can enjoy all of the fireworks and special affects around the lagoon without having to focus your attention on the globe. Kelli and Bill were not happy with the walk back, neither was I. We won’t try to stay at the Boardwalk in the future. We did see a magician/juggler on the boardwalk, and I lingered for a couple of tricks and the start of some juggling, but Kelli and Bill were too tired to stop. We all needed a good night’s rest. Side Note: Pal Mickey remained silent and stationary all day while hanging in front of me on my waist pack belt. We took the car to Animal kingdom and as we crossed the bridge onto Discovery Island the rope dropped. We didn’t feel up to extra walking and crisscrossing the park so we opted for It’s Tough to be a Bug first. 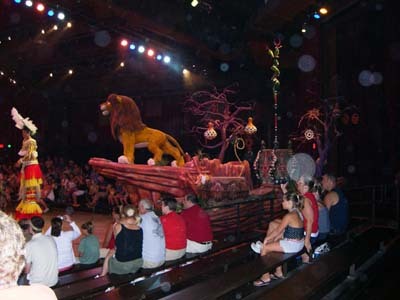 The low crowds made it possible then to make the 9:30 show of Festival of the Lion King. 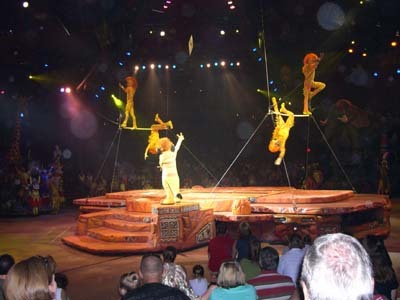 We were able to sit in the Lion section for the first time and the theater was a little less than half full. The show was again, better then we remembered and wondered if they have more energy in the first show of the day. We then checked for fast passes for the Kali River Rapids (they were not giving them out due to the low crowds) and easily make the 10:30 show of Flights of Wonder. Before the show they had a Great Horned Owl out in front at answered questions from the crowd. This show was a first for Bill and me. My mother saw it two years ago while Kelli and I went on the rapids and she recommended it. 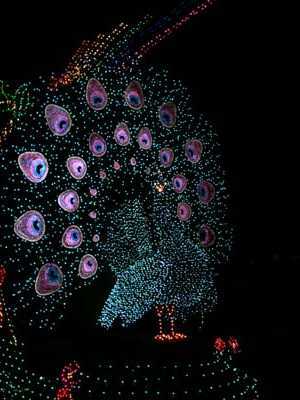 It was a great humorous show with birds flying free. Our favorite was a bird named Sluggo, a species of Seriema from South America that beats its prey, such as a lizard, on the ground to kill or stun it. Not to worry - no lizards were harmed. The bird took his frustrations out on a green plastic one. Then it was onto the nearby Kali River Rapids. Bill chickened out when he saw us putting on ponchos. The ride was good and we didn’t get too wet. We finally got to the Kilimanjaro Safari, the lions were sleeping (o-wim-o-weh, o-wim-o-weh, o-wim-o-weh ... as the Tokens would say) and a ton of Black Vultures, which are native to the US, were everywhere, no doubt picking up a free lunch on Disney’s dime. We saw both Black and White Rhinos well and the giraffes were close. It was getting hot so we left the park. Kelli did some shopping on the way out. 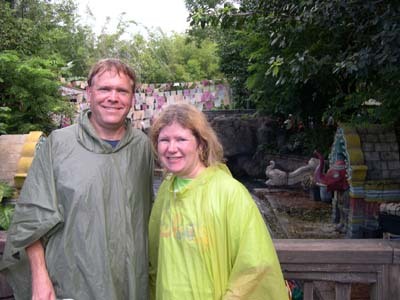 Kelli and I returned to the park after a good rest back at Pop Century for our 4:30 ADR at Yak and Yeti. The park closes at 5 so we knew we’d be leaving well after closing. 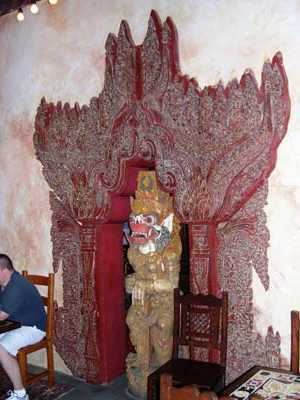 On the way in a guard informed us that Yak and Yeti is run by the same company as the Rain Forrest Café. We arrived early and were seated after a 15 minute wait. The parade just started outside and I could get glimpses of it while I sat. We ordered the Wok-Fried Green Beans appetizer. They were good but not as good as we recently had in TGIF’s. It started raining heavy and we were happy to be inside and I figured it would really clear out the park. Kelli ordered the Baby Back Ribs and I ordered the Shaoxing Steak and Shrimp. We shared and both liked the ribs, the steak was at first very good but we grew tired of it by the end of the dinner; the shrimp were fine but a little greasy. For dessert we had the Fried Wontons and the Sorbet – one scoop each of Mango, lemon, and raspberry. 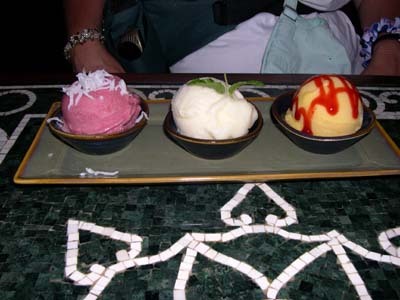 I loved the wontons and the sorbet was refreshing. The meal came to $69 plus a $14 tip, with the dining plan we only had to pay $18.25 out of pocket. The food was pretty much what you would expect at a good chain restaurant - something we could easily get at home. With all the different choices of restaurants we’d try something different next time. We left about quarter to six and the rain had stopped. I was surprised how many other stragglers; not from the restaurant, were making their way out. 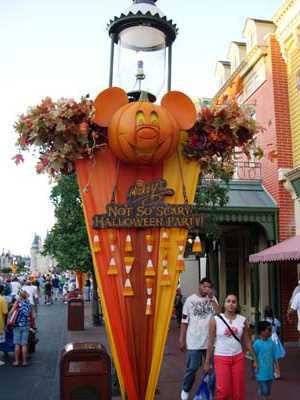 We had three tickets to Mickey’s Not So Scary Halloween Party. Unfortunately Bill decided not to go. He had the Beef and Broccoli from the food court and it wasn’t agreeing with him. So it was just Kelli and I. 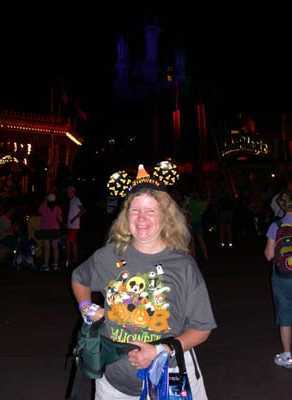 We had brought two Disney Halloween T-shirts at the Magic Kingdom on Wednesday and wore those and headed to the bus stops. I’d say about 65 % of the people at the stop had costumes or Halloween T-shirts on. We arrived just at 7 PM, went through the turnstiles and got our orange wrist bands. 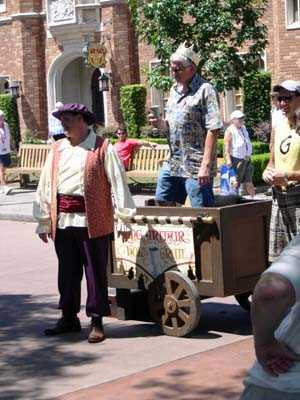 Cast members (CM’s) were still ushering out thousands of people. 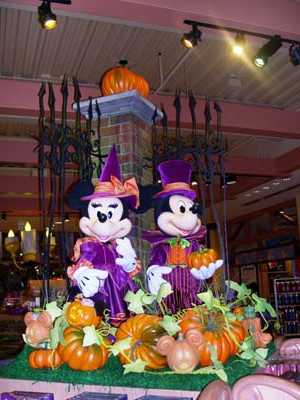 We stopped in the Town Square Exposition Hall and replaced our Pal Mickey since he didn’t seem to be working. The CM’s did a great job at crowd control. 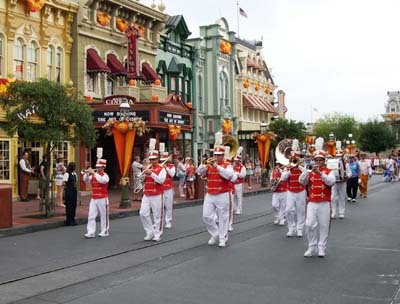 They divided Main Street with CM’s with 2/3 of the street dedicated for those exiting and the other third, (right side) for those attending the Halloween Party. 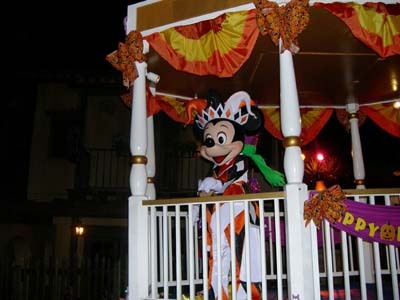 As suggested by those on-line we headed towards Frontier Land where Mickey’s Boo to You Parade started at 8:30. Near the hub Kelli stopped briefly, then started again and chuckled. I asked what happened. She said she thought she saw a character to our left – but it was just someone bending over! We rode the Magic Carpets of Aladdin and they were letting people stay on for a second time if they wished. We stopped at a trick or treating site and got some candy. I went on Pirates of the Caribbean alone while Kelli shopped. We headed over to where the parade starts. 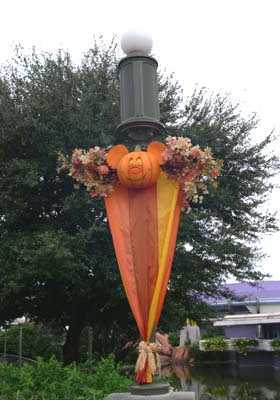 Along the route they had these light stands to illuminate the Magic Kingdom in Halloween orange and purple. I thought that they would dim them for the parade, but they did not. Consider this when looking for a spot to view the parade. It was tough to take pictures and view the parade when you’re staring them. I waited till each float blocked the lights and it made for much better pictures. The Headless Horseman at the beginning and the floats were great. 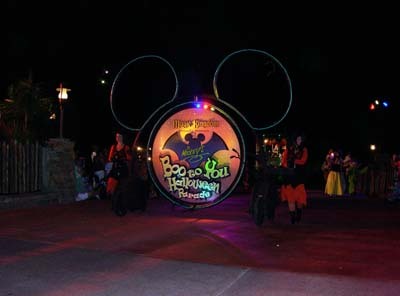 The parade has more performers doing routines and dancing and added to the fun. 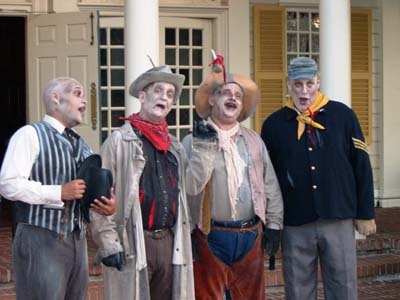 Our favorites were the grave diggers that marched and danced with their shovels. They even scraped them on the ground and made sparks fly. 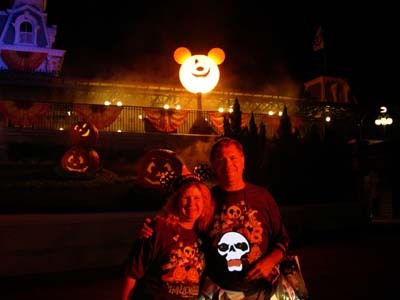 After the parade Kelli brought Candy Corn Mickey Ears and I found this light-up skull where the mouth opens and closes. We headed for the Haunted Mansion. 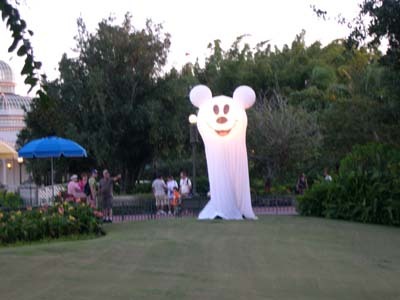 There was an extra ghost, sitting in a chair out on the lawn before walking in. She was looking for a man and Kelli offered me! She said step inside and when I die and become a ghost I can come out and join her. We didn’t have time to make it back to Main Street for the fire works so we opted for outside of Mickey's PhilharMagic. The fireworks were great, many types I haven’t seen before. The finale was awesome, fireworks went up 360 degrees around us, turning the night darkness into daylight as it was so bright. 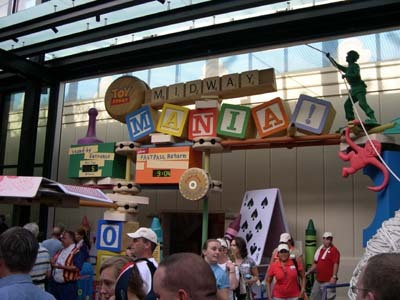 We then headed in for Mickey's PhilharMagic, but had to wait for the crowd to build before they let us into the show. After the show, we grew tired and decided to head out. The bus driver saw the chattering skull around my neck and loved it. He even turned out the lights twice on the bus so people waiting on the bus could see the effect in the dark. I stuck it to the bus window for the ride back for others to see. Kelli and I went to visit friends and their children in Melbourne; a little over an hour away. 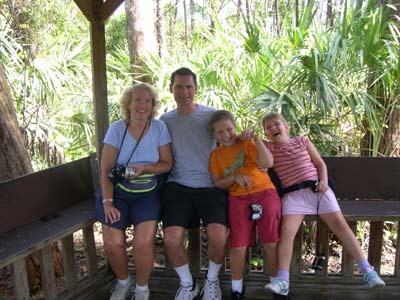 They took us to Turkey Creek Sanctuary in Palm Bay; just to the south. It was hot but we did manage to see some great wildlife. Birds included Blue-gray Gnatcatchers, Black-and-White Warblers, Red-eyed and White-eyed Vireos. 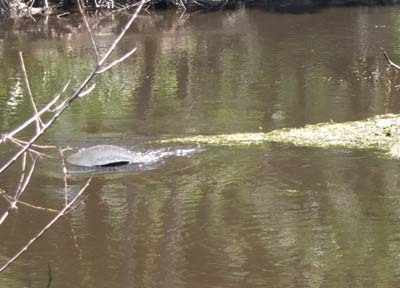 We had turtles in the creek that included more Softshell Turtles, Red-bellied Turtles and Florida Cooters. The highlight of the walk was my life wild Manatee! There were two of them in the creek, only about 30 feet away. On our way out I added another species I haven’t seen: Gopher Tortoises. 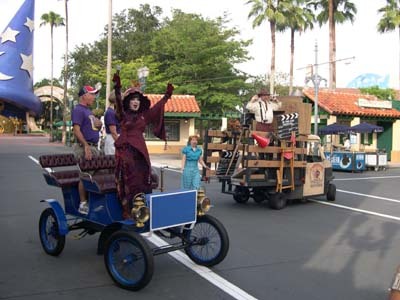 We headed back at sunset and decided to catch the "SpectroMagic" Parade in Magic Kingdom. We quickly parked the car at Pop Century and caught the bus to Magic Kingdom. We positioned ourselves in the square and squeezed Pal Mickey so he could tell jokes, and ask trivia questions. This greatly helped pass the time. He never did become interactive with the parks. Maybe the Halloween decorations were blocking the infra-red signals that tell him where he is. The parade was great and this time I was able to figure out the best settings on the digital camera to get the best images. 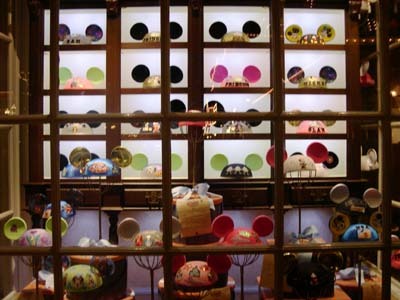 Many people were leaving after the parade so we did some shopping on Main Street and checked out “the make your own Mickey Mouse ears” store on the right called the Chapeau. On the way out of Magic Kingdom, we watched some of Wishes outside the turnstiles to let the crowd leaving the park subside. 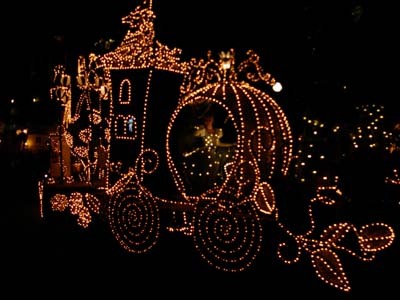 Then slowly walked to the buses and watched the Wishes finale at the bus stop. We were able to get on the bus and leave before the next wave of people descended on the depot and had a bus only half-filled. We headed to Epcot for our final day. We arrived just after rope drop and had another ride on Soarin’; we got the center back row seats this time. We grabbed fast passes for later and headed over to Test Track. Bill enjoyed his first time on. He even checked out the cars in the showroom area for his dream car. 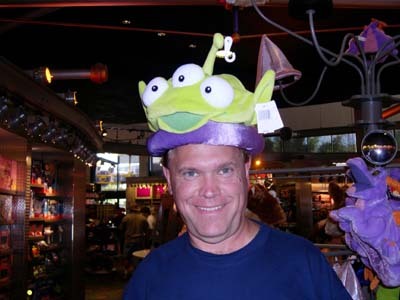 I wanted to do Mission Space, Orange Ticket while Bill rested and Kelli shopped. I had my longest wait for the entire trip, about 15 minutes, and enjoyed the G-forces again. We headed back to the land pavilion and ran across the JAMMitors. 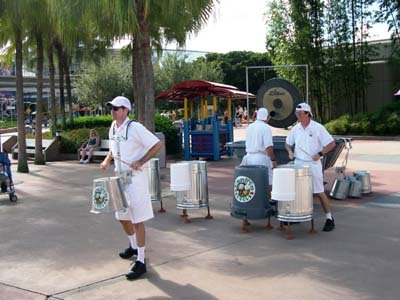 This percussion group uses garbage cans and plungers and put on a good but brief show. Our fast passes were good so we did our third trip on Soarin’. We were disappointed that we got the far right back row seats, but enjoyed it anyway. You can still try and kick the heads of the canoeists from the back row. Kelli heard a great line from a mother pushing a boy in a stroller. The mom said the first part in a sweet voice, the second part not. “OK Sweetie …now GET OUT.” That made my day. We did Living with the Land, which somehow Bill never saw. 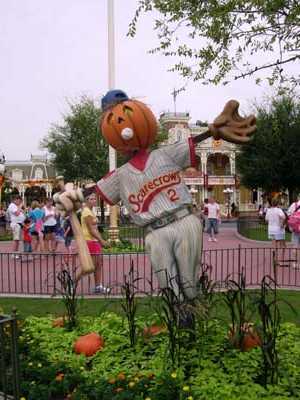 He was here for 9 days in 2006 but still missed lots of major attractions. Bill decided to head back to rest his feet and enjoy the pool. 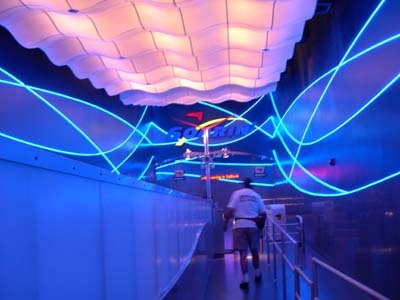 Kelli and I then went on Journey into Imagination with Figment. We caught a fountain show where it dances to a song, then headed for the countries. We hadn’t seen the updated Canada movie and just missed a showing and had to wait 15 minutes for the next. We were joined by 23 other people – crowds are certainly low! I liked the updated version with Martin Short. On the way out I heard frogs calling in the pond in the Canadian garden - too hot for frogs in the middle of the day – the calls are piped in, never noticed this before. We headed to England and saw the World Showcase Players put on a "King Arthur & The Holy Grail" skit with three people selected from the audience. It was funny and enjoyable. We then went in search of potato chips. 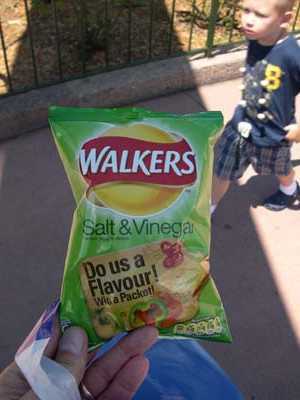 I asked a lady in one of the stores that I heard about these potato chips from England. She replied in a delightful English accent “You mean crisps! They’re called Walkers.” and she pointed me in the right direction. Unfortunately they only had one flavor left – salt and vinegar. They had run out of cheese and onion. We bought three bags anyway and they were very good. Hopefully next time we can try one of the more unusual flavors. 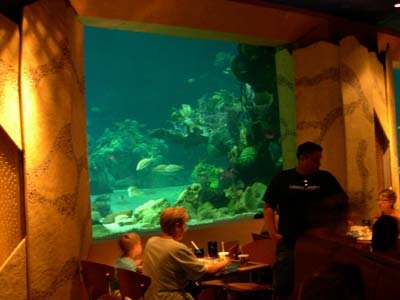 We headed back to the Seas pavilion in hopes of getting in early for our lunch at the Coral Reef. Epcot had no crowds, but when we went through the doors into the Coral Reef there were people everywhere waiting for their table. We checked in 35 minutes early, but it didn’t matter, we were seated after a 34 minute wait. We sat in the second tier. Kelli ordered Mixed Greens – with key lime-herb vinaigrette and the Grilled Pork Chop – served with caramelized shallots and sweet onion mashed potatoes topped with wild mushroom sauce. I had the Creamy Lobster Soup and the Blackened Catfish - served over pepper jack cheese grits with smoked tomato compote and Balsamic glaze. My soup was delicious and shared some with Kelli. We both enjoyed our entrées and ordered two Chocolate Waves for dessert. They were great as usual. Overall we thought that the preparation of the meals wasn’t as good as last year for dinner, but still good overall. We shopped in Mouse Gears for a while and took pictures of me wearing different silly hats including a Dale chipmunk hat and a Little Green Men hat. I wanted one last ride on Spaceship earth before leaving to try to capture some of the video at the end on the camera. The ride was good and caught some decent video of the video. We headed out with the sun beating down our backs. We spent the evening packing and relaxing. We had an early breakfast at the food court and I quickly fed some of the turtles in the pond to get some better pictures of them. We caught up with Bill and packed the car for the trip back to the airport. Our 10:30 AM flight home went smooth and arrived home in New York a little before 2 PM. It was a good quick trip and we’re looking forward to next year, staying off site that will include my mom and our nieces.